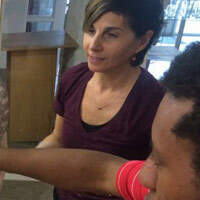 Internationally recognized independent ceramic artist and scholar. 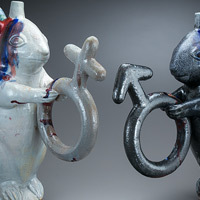 Internationally recognized for her mastery of colonial era ceramic techniques her pieces reinvent ceramic history to create 21st century social political and environmental narratives. 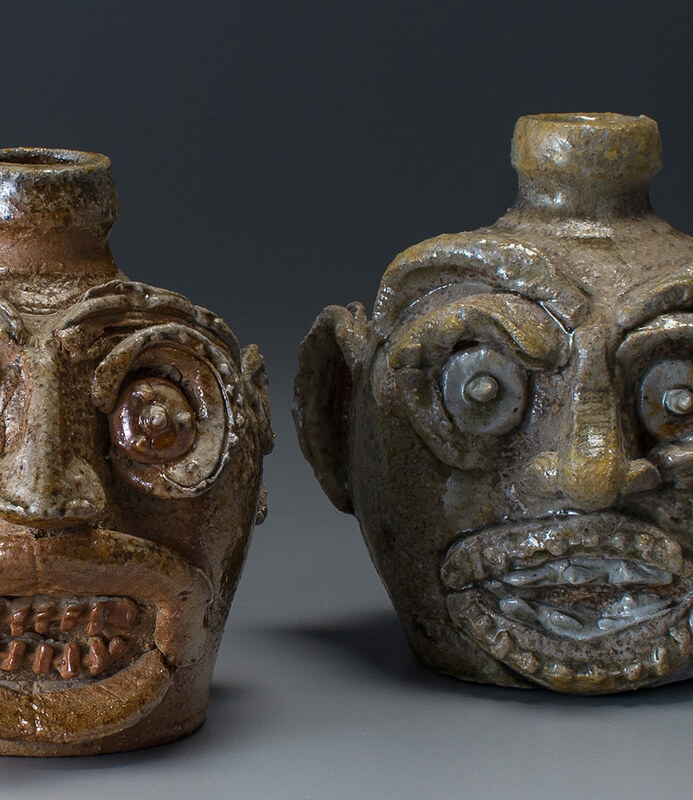 Erickson's works are distinguished by insightful commentary on the universal character of the human spirit and her art stands apart from much of the contemporary ceramic and craft community by its historical depth and technological virtuosity. Erickson's highly sought creations have reinvigorated distinguished decorative arts collections by connecting past and present. 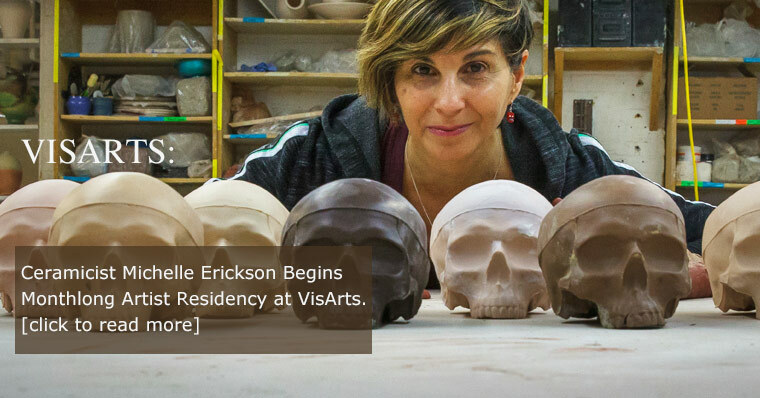 Ceramic artist Michelle Erickson will discuss her practice as a studio potter whose art is distinguished throughout the fields of contemporary art, historical archeology and studio ceramics by its strong commentary, historical depth and technological virtuosity. 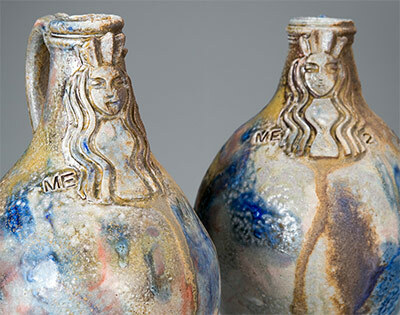 Michelle Erickson gives dynamic relevance to the legacy of ceramics as a form of social expression. 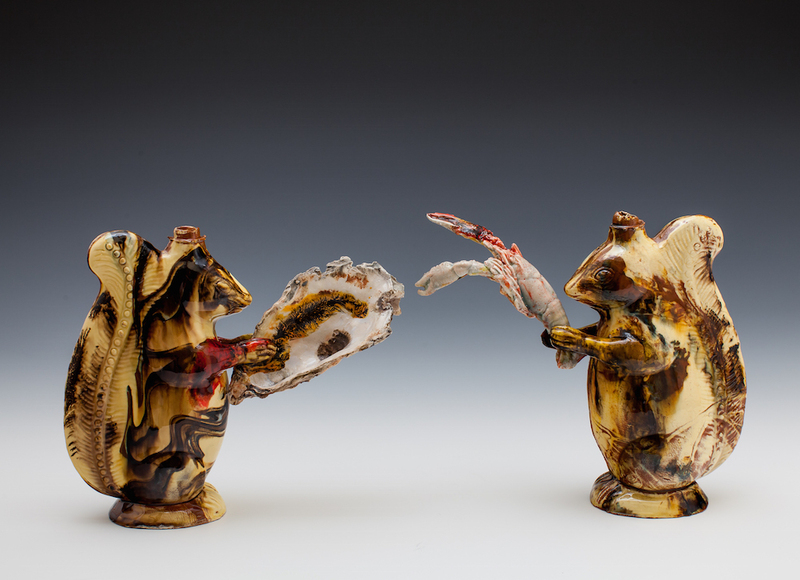 "Michelle Erickson's recent work combines historical methods with contemporary politics, redefining the function and aesthetic of clay, and activating it as catalyst for discussion." 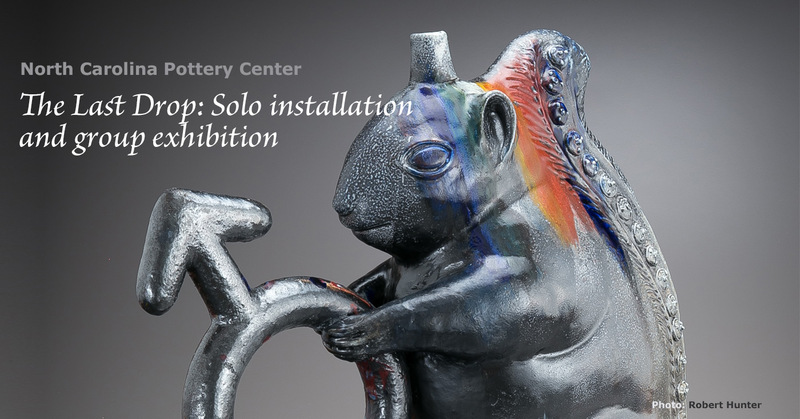 "...Other areas of the exhibition will focus on ceramic artist Michelle Erickson's historical approach to recreating antique ceramics and the alcohol-related ceramics of 19th century North Carolina." 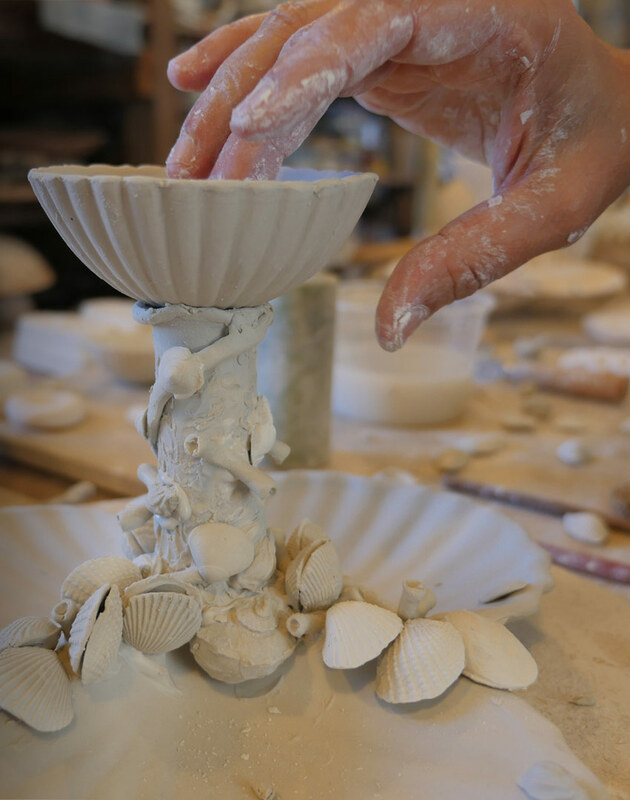 "Virginia-based artist Michelle Erickson reimagines a style of vessel originally developed in medieval Persia and then readapted by 17th-century Dutch and English delft and slipware potters for drinking posset, a festive libation. Erickson was inspired by Chaucer's poem "The Parliament of Fowls," a 14th-century meditation on nature and love." 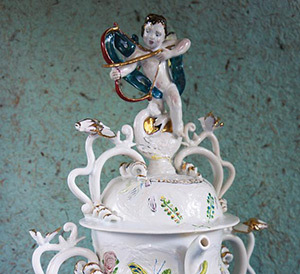 "...Far less frequent than this kind of imitation, and confined almost exclusively to the late 20th and early 21st centuries, has been historical allusion in ceramics developed explicitly in the service of cultural critique. 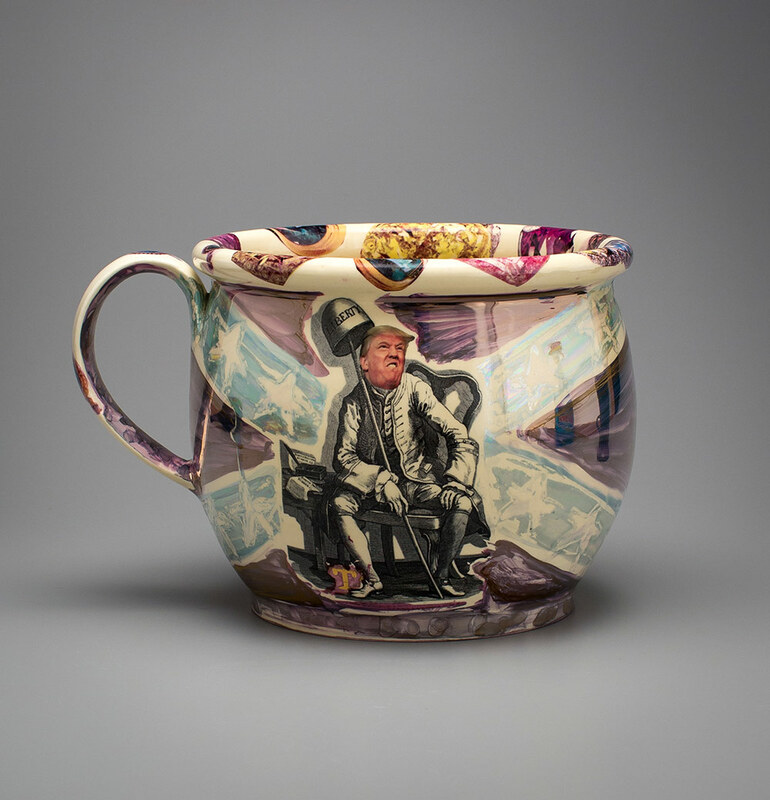 While this tendency has become common enough to define a genre of current ceramic art, few ceramic artists can match the nuance and complexity with which it has been practiced by master potter, ceramics researcher, and cultural critic Michelle Erickson...."
"Erickson's limited edition Made In USA mugs use a line of commercially available American made Starbucks mugs as the vehicle for her prescient 2013 political satire The Party's Over. While Trump Esq. transforms the satirical 18th century engraving of John Wilkes Esquire by William Hogarth into a political portrait of Trump. 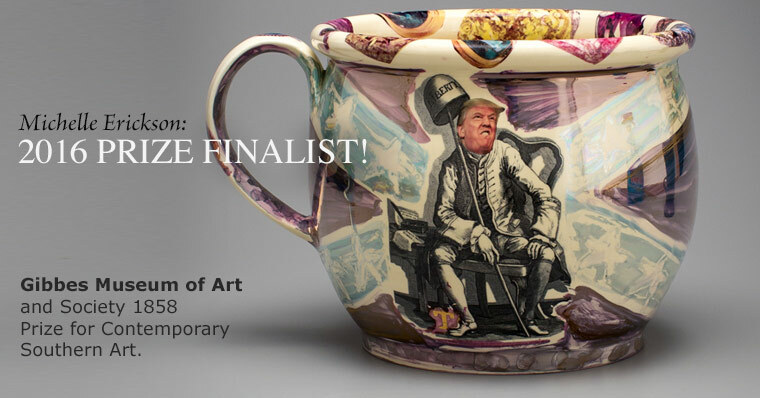 Erickson draws distinct parallels between Wilkes and his 'populist' paper The North Briton and Trump's propaganda machine of 21st century social and mainstream media..."
"Erickson's fascination with ceramic history is due to her exposure to archeological ceramics within the Colonial heritage and history prevalent in Virginia. 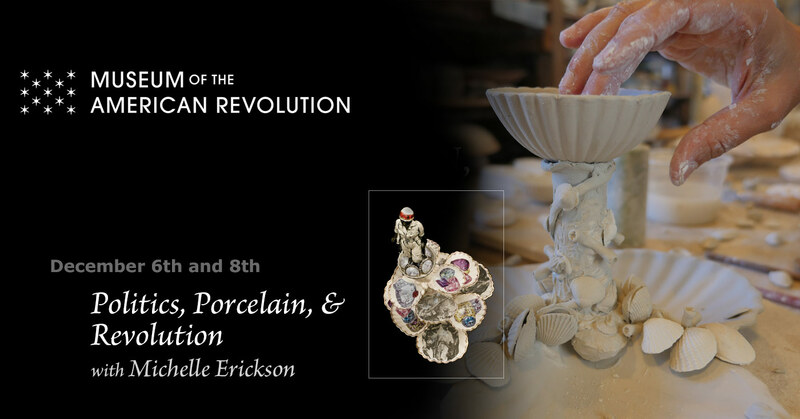 She has reproduced ceramics for collections and organizations such as Colonial Williamsburg, the National Park Service, the Museum of Early Southern Decorative Arts and the Philadelphia Museum of Art..."
"In the exhibition You & I Are Earth Erickson explores the ceramic medium as a record of human experience embodied in the objects of our lives, from those we discard to what we cherish, revere and protect. 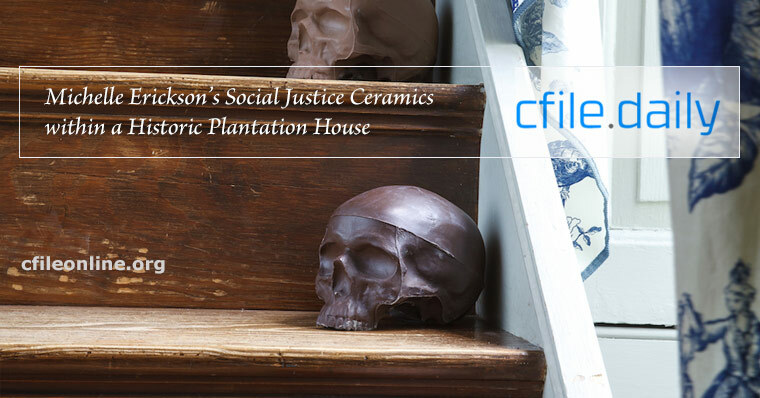 Themes of race culture and social justice in Erickson's 21st century narratives provide a provocative lens within the intimate context of an 18th century family and household to reflect on our present historical moment..."
"Erickson is best known for analyzing contemporary culture through the use of 17th and 18th-century Colonial American ceramic history, combining traditional pottery-making methods with contemporary narratives. 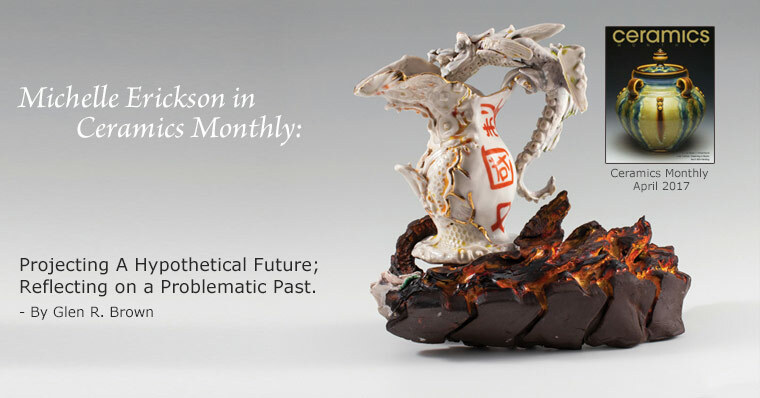 Her work is in the collections of the Mint Museum of Craft and Design, the Museum of Art and Design in New York, the Milwaukee Art Museum and the Yale University Museum, among others..."
"Erickson practices something called "experimental archeology," an intensive examination of historical and traditional ceramic techniques that she then reworks with a contemporary political slant. We spoke over the phone about history, Ai Weiwei, and the wrongness of calling what she does "women's" arts..."
"...an engaging, provocative postmodern survey of animal sculpture in ceramics and multi-media that is rich in symbolism, metaphor and eco-activism..."
"Erickson is internationally recognized for both her contemporary art and historical scholarship in the rediscovery of colonial era ceramic techniques. 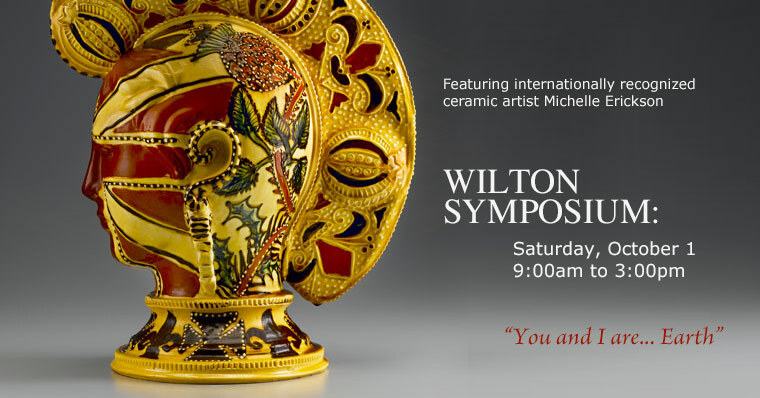 Michelle will share her mastery in the lost arts of slipware, agate ware, life casting and modeling. 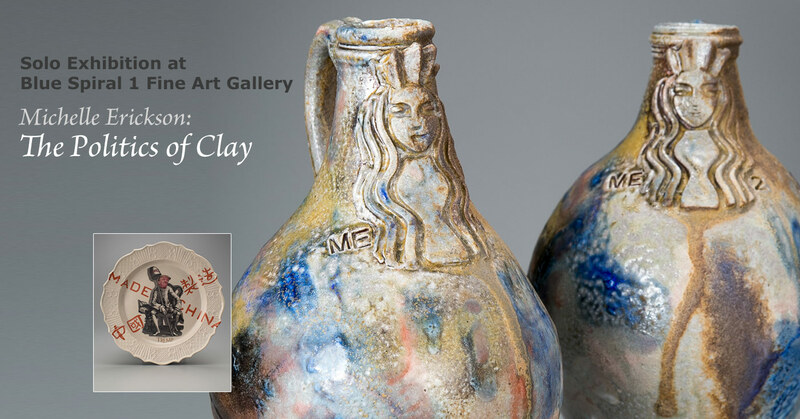 Her intimate demonstration will give a close up look into innovative techniques old and new including a wheel thrown18th century English Puzzle jug, and the surprising transformation of urban artifacts and industrial designs into 21st century clay that speaks." "Internationally acclaimed artist, Michelle Erickson creates thought-provoking sculptural works that comment on life in the twenty-first century. 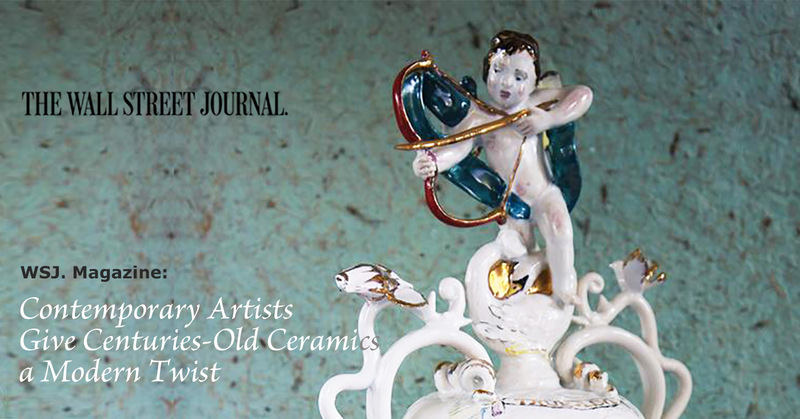 Years of scholarly research into lost ceramics arts from the seventeenth and eighteenth centuries inform her narrative works. She infuses these rediscovered arts with social, political and environmental observations to create masterful works that engage and inspire..."
"Her exquisite recreations and contemporary pieces have won critical acclaim internationally and been featured in many national and international publications. She is currently showing at Virginia MOCA through August..."
"Contributors range from well known, professional artists to grieving aunts and brothers of victims. Opening their virtual doors to almost anyone was a wise and inclusive move on the part of the organizers, creating a true â€œpeopleâ€™sâ€� exhibit. Herein lies diversity in all its glory, something constantly boasted but rarely achieved. 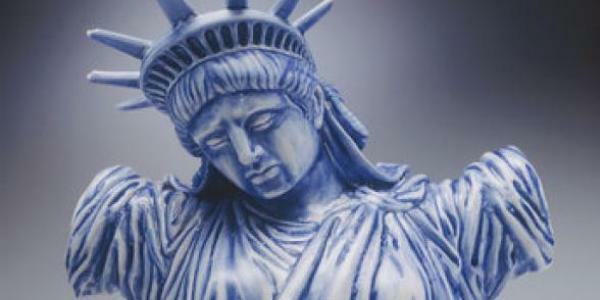 Virginia artist Michelle Erickson crafts exquisite ceramic artworks and offers an unusual take on Lady Liberty in the style of Delftware. 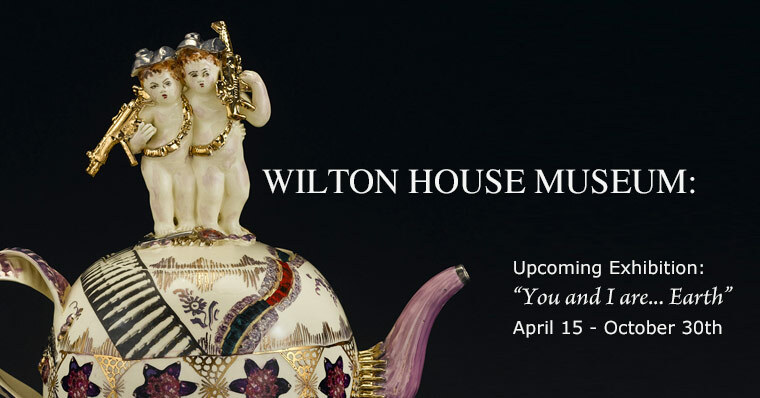 Her version is armless, possibly crucified and greatly grieved, a cross beween Venus de Mileo and some Pieta..."
The Metropolitan Museum of Art in conjunction with the exhibition "Making Pottery Art: The Robert A. Ellison Jr. Collection of French Ceramics (ca. 1880-1910)"